Ibrahim Mahama, Untitled (in two parts) on view at Sotheby's on March 29, 2019 in London, England. Photo by Michael Bowles/Getty Images for Sotheby's. Buyers from the continent accounted for 70 percent of the sales on the night. 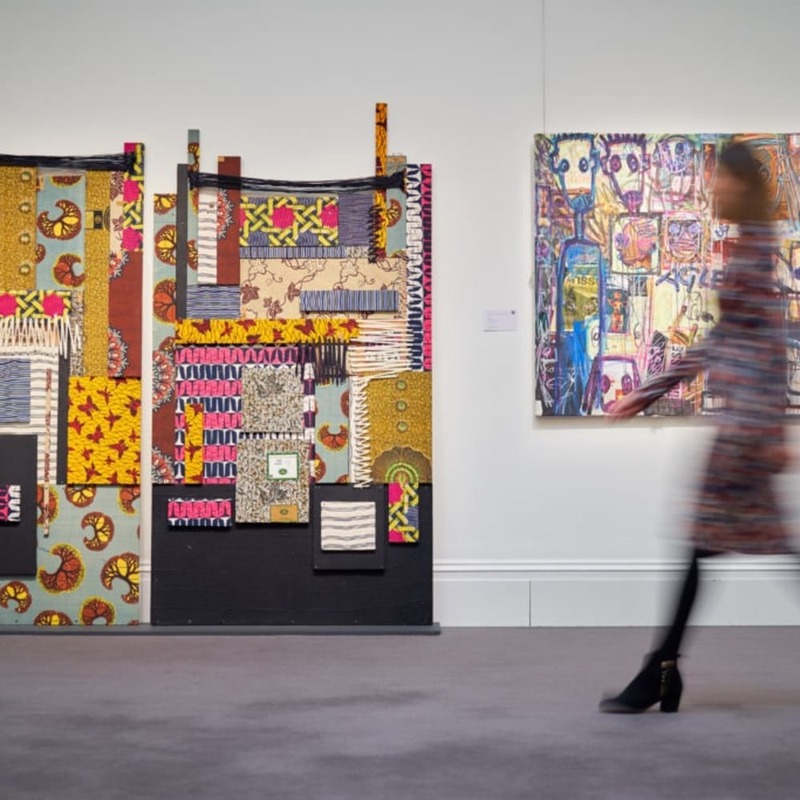 Art market forecasters would do well to pay attention to yesterday's auction of modern and contemporary African art at Sotheby's London. The fourth such sale by the auction house generated a total of £2.3 million ($3 million), just above the pre-sale estimate of £1.5 million to £2.2 million. And while that total is small potatoes in the world of high-flying auction sales-indeed, in today's dollars, it's a mere one-fifth of a KAWS-it's a notable figure in a sector that is likely to become more important in the global market of the future. Crucially, buyers from the African continent accounted for 70 percent of the 75-lot sale's total, according to Sotheby's. And those collectors are quickly gaining buying power. Nigeria has the fastest-growing number of high-net-worth individuals in the world, with the number of people whose net worth is between $1 million and $30 million estimated to grow by a compound annual rate of 16.3 percent between now and 2023, according to a survey by the wealth research firm Wealth-X. Kenya is not far behind, with an estimated growth rate of almost 10 percent. The Sotheby's sale set new auction records for 11 artists, a number of whom are unfamiliar to the Western art world-but they may not be unfamiliar for long. Before her work began tearing up records in evening auctions in New York and London, Nigerian-born artist Njideka Akunyili Crosby posted a precipitous rise in auction prices at modern and contemporary African art sales. Eddy Kamuanga Ilunga, Congolese Palm (2016). Courtesy of Sotheby's. Other artists whose work gained new high marks at the sale include Senegalese artist Omar Ba; the 35-year-old Brooklyn-based, Côte d'Ivoire-born painter Abdoulaye Diarrassouba; the late Moroccan master Hassan El Glaoui; and the late pioneering Nigerian photographer J.D. Okhai Ojeikere, whose record was broken twice in the same evening. The lion's share of the total, however, was generated by El Anatsui's work. With an established international collector base and a reputation that has only been burnished by the news that he will represent Ghana in the Venice Biennale this year, El Anatsui has long been a blue-chip powerhouse. He is also the subject of a retrospective in Munich organized by the late Okwui Enwezor and Chika Okeke-Agulu (through July 28). His glittering bottle-cap tapestry Zebra Crossing 2 (2007) sold for £1.1 million ($1.4 million), well above its presale estimate of £550,000-750,000. The work previously sold at a Sotheby's contemporary evening sale in London in 2013, where it made $771,788. 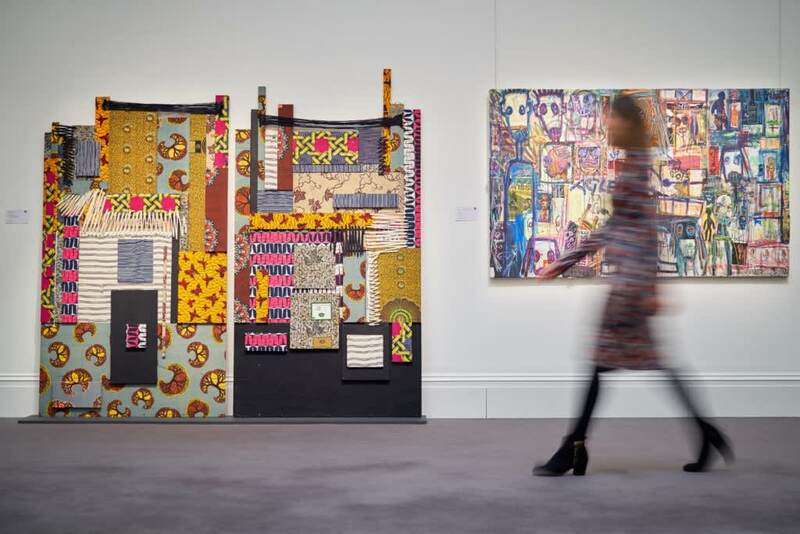 Last evening's sale is not the highest total achieved in the category-that title goes to Sotheby's May 2017 modern and contemporary African art auction, which totaled £2.8 million ($3.6 million). But yesterday's auction is a marked gain on its equivalent sale last year, which generated £1.8 million ($2.6 million), and it is likely an auspicious signal for the future. Installation view of works by Alexander Skunder Boghossian, El Anatsui, and Kamala Ibrahim Ishaq. Courtesy of Sotheby's.